Modern metal can be a sound that is ripe with experimentation. While some may view it as going too far outside the boundaries of metal, bands that can handle the balancing act properly can often reap some large rewards. It’s easy for a band in this area to have some ‘cross-over’ appeal with more mainstream listeners, and still maintain a feeling of genuine metal power if executed properly. It’s something that Metalite should have no problem accumulating with the strength of their debut, Heroes in Time. 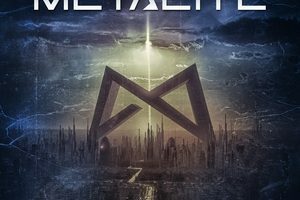 Capturing high-energy electronic synths and merging them with a legitimate power metal structure, Metalite have a sound that’s hard to ignore. There’s metal, there’s more danceable vibes, and a genuine feeling of happiness (a rarity in these parts) as you listen to their debut. 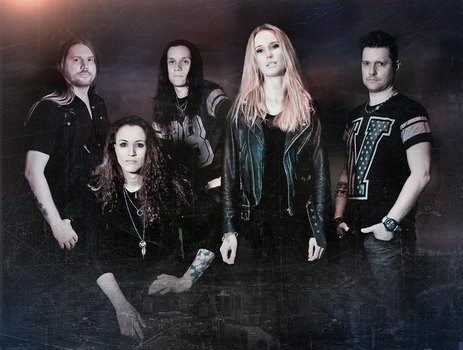 Curious to learn more about the band and their origins, we sent guitarist Edwin Premberg some e-questions to shine more light upon the up-and-coming act. Dead Rhetoric: What’s behind the name, Metalite? Edwin Premberg: The name Metalite just popped up when I was planning the new modern sound for the first song. Well, its metal and I wanted the sound to be ”l33t” or ”1337” (Which means ”Elite” in the online language ”Leet” used in BBS and nowadays Online Gaming.) That formed the band name Metalite which have the modern touch that perfectly fits the sound. Dead Rhetoric: How would you describe the sound of Metalite to someone who has not heard the band? Premberg: I should say modern power metal with an electronic touch. Melodic and memorable melodies that sticks in your head. Dead Rhetoric: How did you hook up with Inner Wound Recordings? Premberg: In the early stage when I promoted the first song, Inner Wound was the first record label I sent the demo to. I have listen a lot to the artists on that label so this was a perfect fit. Dead Rhetoric: What do you hope that people take away from Heroes in Time? Premberg: I hope that people that listen to Heroes In Time will get their bodies filled with energy and they should feel happy. Dead Rhetoric: Any songs that you feel really define what Metalite is all about? Premberg: I think that “Afterlife” and “Nightmare” are two signature songs of the sound of Metalite. Then you have the song “Purpose Of Life” which lyrically defines Metalite; the song is about ambition. Dead Rhetoric: Could you touch upon some of the lyrical topics for the album? Premberg: Yes, of course. For example the song “Heroes In Time.” We live in an electronic and digital world and this song is about that. How big internet companies saves your data and how ordinary users of their services have no clue about it. You like, you share, you comment stuff and you think you’re the ‘Hero In Time.’ Maybe this could go against you some day? Dead Rhetoric: How much of a role did Jacob Hansen play in the album’s sound? Premberg: Jacob had a big role of the sound of Heroes In Time. I knew what the songs were going to sounds like and he laid his magic hands on the material and mixed and mastered the album. He is really a god to me and I´m so happy that he wanted to help us with this. Dead Rhetoric: What can you say about the recently released “Afterlife” video? Premberg: Some will say that this song is about religious stuff but it isn’t, not for me. Though it can be if you want to interpret it that way. The song “Afterlife” is more about the ”good” and the ”bad” inside you. If the “bad” wins over your ”good” sides you´ll probably NOT have a good afterlife ;). As the text refers to Paradise, it can be whatever. Paradise can be your goals and your visions etc. We´re really happy that so many have listened to the song and streamed our video, as we speak the counter says near 130.000 views in 12 days. Dead Rhetoric: A number of comments on the “Afterlife” video say they found the band through a YouTube ad. Do you feel that it has been a successful way to get some publicity? Premberg: YouTube is a great way to promote your stuff, especially in Sweden where there aren’t so many of the metal info channels like TV, Radio etc. So I should say that without YouTube and a promotion plan this would not have been possible. Dead Rhetoric: Using more electronic elements in modern metal seems to be on the up and up. What do you think is key in terms of balancing those two parts? Premberg: I think you have to combine those two elements (Electronic sounds and the metal stuff) in a way that makes it sound modern and fresh. We use the electronic element quite aggressively in our production if you compare to other bands and of course in some cases I had to be restrained, but I think I got the right balance between those two elements and got the Metalite sound were I wanted it to be. At last, the key in this production maybe would be the interaction between the lead keyboards and the lead metal guitars. Dead Rhetoric: Do you feel that incorporating a more electronic feel to the band opens it up for appeal outside of the purely metal realm? Premberg: Yes of course! I have already had those thoughts in mind. I know some producers that would be more than glad to join the next production. Dead Rhetoric: What does the band do outside of Metalite? Premberg: Everyone have full-time jobs outside Metalite. Besides that we have families and different interests that take up our time. Dead Rhetoric: What are some short term (6 months) and long-term goals (5 years) that you hope to achieve with Metalite? Premberg: Hmmm 6 months…I hope that we can go out and play on the festivals next year and maybe tour with a greater band through Europe or USA. It would a dream for me! The long-term goals maybe would be to release another album, maybe two, and get a larger fanbase that we can be headliners for different festivals around the globe. Of course Loud Park or 70.000 Tons of Metal also are included there. Dead Rhetoric: What’s going on with Metalite for the rest of 2017 and into next year? Premberg: We´re planning to have a release party here in Stockholm Nov/Dec this year and also discuss the plans for next year, festivals etc. Of course we are very excited to follow the release wordwide and hope that it will be a success!